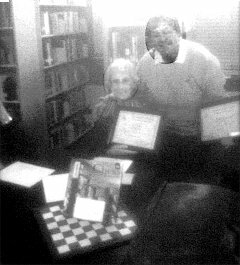 At the January 2008 meeting of the Haralson County Historical Society, Mrs. Peggy Kimball, to date the longest-serving former President of the Society, whose administration was marked by the triumphant reopening of Buchanan's Historic Courthouse, was honored in a ceremony acclaiming her as County Family Historian. She was unanimously voted this original title by the Society in June 2007 and is seen in the photograph at left receiving a certificate testifying to such. HCHS Pres. Karen Higgins (right).